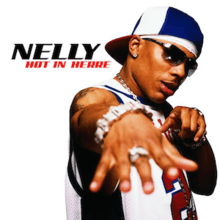 "Hot in Herre" is a song by American rapper Nelly from his second studio album Nellyville (2002). The song features additional vocals by former labelmate Dani Stevenson. It was released on April 16, 2002, by Universal Records as the second single from the project. The song was produced by The Neptunes and serves as the opening track of the 2002 compilation album Now That's What I Call Music! 11. "Hot in Herre" incorporates the hook from go-go performer Chuck Brown's 1979 single "Bustin' Loose", and opens with samples from Neil Young's "There's a World" and Nancy Sinatra's cover of "As Tears Go By". Nelly won Best Male Rap Solo Performance, a brand new category at the time, for "Hot in Herre", at the Grammy Awards of 2003. In 2008, it was ranked number 36 on VH1's 100 Greatest Songs of Hip Hop. The song was Nelly's first number one hit on the Billboard Hot 100 and in Canada. It peaked at number four in the United Kingdom, and also hit the top ten in other international markets. The song was number three in the Billboard Year-End Hot 100 Singles Chart for 2002. There were two music videos made for the single "Hot in Herre", one set in a dance club, and an alternative one shot at the St. Louis Arch. The alternative video was played on MTV Europe instead of the official one. The original video features cameo appearances by actor and comedian Cedric the Entertainer, NBA player Carmelo Anthony, and NFL players T.J. Duckett and Julius Peppers. Canadian electronic artist Tiga, who remade "Hot in Herre" with Scissor Sisters lead singer Jake Shears on vocals, giving it a more monotone, electro feel (this reached number 46 in the UK). A music video was created for Tiga's version of the song which aired in heavy rotation. The video starred puppets depicting cliche scenes from hip hop videos of the era. Widespread Panic, whose cover was included on their covers album Jackassolantern and was featured on an episode of The O.C..
Jenny Owen Youngs, whose version also had an accompanying video. The BossHoss covered the song. In the live version of "Jocko Homo" on Devo's album DEVOlution is Real: Live in Central Park, Mark Mothersbaugh briefly sings the chorus of "Hot in Herre" before the song's "O-HI-O" breakdown. Jill Sobule covered the song acoustically at a live performance in Seattle with Melissa Ferrick. Wang Chung performed the song on the television show Hit Me, Baby, One More Time. The song was parodied as "Trash Day" by "Weird Al" Yankovic on the album Poodle Hat, replacing the chorus with "There's somethin' rotten here, you better hold your nose," and also by Mad TV in a sketch satirizing the controversy surrounding the Catholic Church and young boys. ↑ "Jenny Owen Youngs "Hot In Herre"". YouTube. 2007-09-26. Retrieved 2012-08-06. ↑ "Discogs". Discogs. Retrieved 2012-08-06. ↑ "Australian-charts.com – Nelly – Hot in Herre". ARIA Top 50 Singles. ↑ "Austriancharts.at – Nelly – Hot in Herre" (in German). Ö3 Austria Top 40. ↑ "Ultratop.be – Nelly – Hot in Herre" (in Dutch). Ultratop 50. ↑ "Ultratop.be – Nelly – Hot in Herre" (in French). Ultratop 50. ↑ "Nelly – Chart history" Canadian Hot 100 for Nelly. ↑ "Danishcharts.com – Nelly – Hot in Herre". Tracklisten. ↑ "Lescharts.com – Nelly – Hot in Herre" (in French). Les classement single. ↑ "Musicline.de – Nelly Single-Chartverfolgung" (in German). Media Control Charts. PhonoNet GmbH. ↑ "Italiancharts.com – Nelly – Hot in Herre". Top Digital Download. ↑ "Dutchcharts.nl – Nelly – Hot in Herre" (in Dutch). Single Top 100. ↑ "Charts.org.nz – Nelly – Hot in Herre". Top 40 Singles. ↑ "Norwegiancharts.com – Nelly – Hot in Herre". VG-lista. ↑ "Swedishcharts.com – Nelly – Hot in Herre". Singles Top 100. ↑ "Swisscharts.com – Nelly – Hot in Herre". Swiss Singles Chart. ↑ "Nelly: Artist Chart History" Official Charts Company. ↑ "Nelly – Chart history" Billboard Hot 100 for Nelly. ↑ "Nelly – Chart history" Billboard Pop Songs for Nelly. ↑ "Nelly – Chart history" Billboard Hot R&B/Hip-Hop Songs for Nelly. ↑ "Nelly – Chart history" Billboard Hot Rap Songs for Nelly. ↑ "The Billboard Hot 100 Singles & Tracks - Decade Year End Charts". Billboard. Prometheus Global Media. Retrieved April 18, 2011. ↑ "ARIA Charts – Accreditations – 2002 Singles". Australian Recording Industry Association. Retrieved October 6, 2013.